Boy oh boy, has this scam alert created a stir or what? I guess it is time for a brief update before the owner of American Smoke has a stroke. In the piece below I state that their juice is cheap Chinese juice. For the record, the owner of American Smoke states that it is not. He states that it is, in fact, American made juice. If his eLiquid is indeed made in America then I was wrong. However, since the website for American Smoke (both of his websites) have identical business practices of XO, Lift Vapor, et al, it was my opinion that the companies were related. From what I understand now, only the “affiliates” are related. It seems there are companies out there that market these brands, several of them at a time actually, with the same website code, same graphics, etc. However, the owner claims that “his” website, the one he is “responsible” for is different that the one we went to (I went to). Well, see for yourself. http://tryamericansmoke.com and http://tryamericansmoke.com/best-offer/ The first one is “his” website, the one he admits he is responsible for, and the second is an “affiliate licensed” site, or some such thing. Why they are on the same server in the very same httpdocs directory is fishy, but whatever. When, or if, you go to the two sites you will see that the verbiage is identical, the terms are identical, the prices are identical, the trial period is identical, so honestly, I have no idea why he is upset with his affiliates marketers, they are using the same words he’s using. The “photos” are different though, if that matters. The owner claims he is trying to run down who made the claims you can so plainly see below, his manufactured outrage is what’s bewildering to me. If the verbiage is the same then there is nothing and no one to run down. Am I wrong? In addition, the owner states that I had no right to say that American Smoke eLiquid was terrible. He is right, I don’t. Since his claim is that he is NOT the same company as Lift Vapor, Regal, XO, et al, and that he has only hired the same people to run affiliates sites then I had no right saying it tasted like crap. I may be 99.99% sure that it does taste like crap based on his business practices , but I do not know for certain. As for the rest of the piece, I stand by every word. An email claiming that a “free” starter kit was waiting for me, only to wind up not being free at all is absolutely true, and I provided photos to prove it. The 14-Day “trial” period that begins the moment you click the “submit” button is right there in black and white (on both sites), the $39.99 price for 15-cartomizers is right there (on both sites), the “copy” that describes a 3-piece e-cigarette and graphics that show a 2-piece e-cigarette is right there (on both sites), the $50 “discounted” price for the starter kit if you keep it is right there (on both sites), the “No Risk” offer is proven untrue, that $4.95 and the return shipping is gone, you ain’t getting that back. On both sites. Is this any way to run a long-term e-cigarette brand? I don’t think so, but maybe he does. In this morning’s email Inbox was an email with the subject line: “Girls hate cigarette breath”. Being a girl, I had to admit it to myself, yes… indeed I do hate cigarette breath. In fact, looking back, I don’t understand why the women I dated over the years, the ones that did not smoke, put up with it. Ever since I quit smoking I can’t imagine dating a smoker, I don’t care how gorgeous she is. In any case, without thinking I clicked on the email because I thought it was an article in SodaHead, my morning guilty pleasure for reading material. It wasn’t. The email contained a graphic. This is the graphic, provided by my operating system’s ability to take screenshots. Notice the statement in clear English? Now, let me ask you; if you were a smoker interested in switching to an electronic cigarette, but you weren’t quite sure you wanted to drop $250 for an eGo device at the Mall Kiosk (highway robbery right there too! ), wouldn’t YOU click the link to claim your FREE Starter Kit? Of course you would. Look familiar? 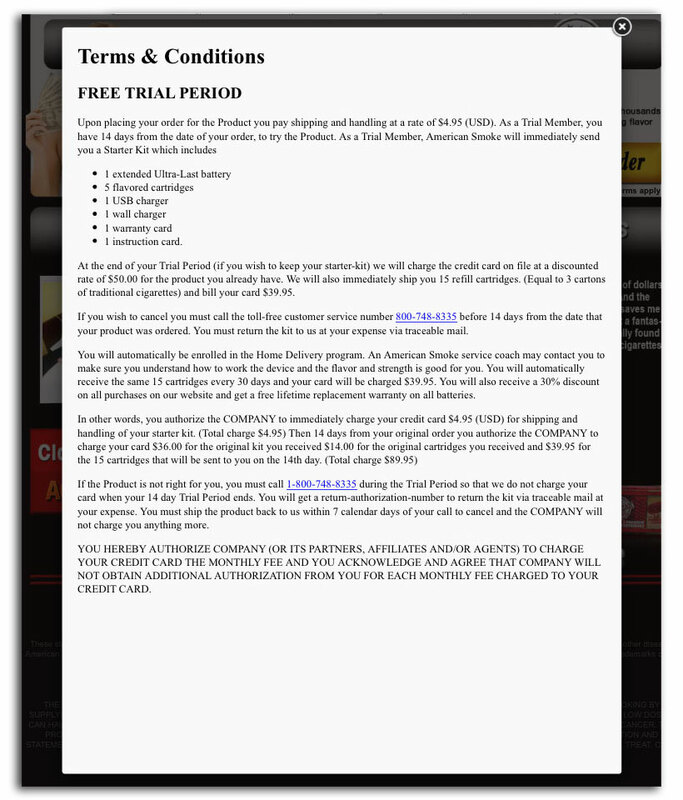 Sure, it looks exactly like all the other “free starter kit” scams we’ve written about. So, where is this “free starter kit”? And who the hell voted these guys The #1 Electronic Cigarette? Their employees? Jesus, I hate this kind of crap! As you can see, there is NO free starter kit. All of a sudden it’s turned into “Claim Your Exclusive Starter Kit”… What happened to “free”? Okay, so here’s the problem: When are these guys going to update the copy of their cookie cutter websites? Are you getting a 3-piece e-Cigarette with an atomizer, cartridge and battery that were popular in 2010, or are you getting the 2-piece cartomizer and battery? Which is it? The photograph shows the 2-piece kit and the words say a 3-piece kit, which one is it? At the end of your Trial Period (if you wish to keep your starter-kit) we will charge the credit card on file at a discounted rate of $50.00 for the product you already have. We will also immediately ship you 15 refill cartridges. (Equal to 3 cartons of traditional cigarettes) and bill your card $39.95. If you wish to cancel you must call the toll-free customer service number 800-748-8335 before 14 days from the date that your product was ordered. You must return the kit to us at your expense via traceable mail. You will automatically be enrolled in the Home Delivery program. 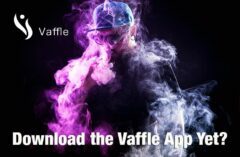 An American Smoke service coach may contact you to make sure you understand how to work the device and the flavor and strength is good for you. You will automatically receive the same 15 cartridges every 30 days and your card will be charged $39.95. You will also receive a 30% discount on all purchases on our website and get a free lifetime replacement warranty on all batteries. What you’re actually paying is $89.95 + $4.95 = $94.90 for a Starter Kit and 20 cartridges or cartomizers. If the Product is not right for you, you must call 1-800-748-8335 during the Trial Period so that we do not charge your card when your 14 day Trial Period ends. You will get a return-authorization-number to return the kit via traceable mail at your expense. You must ship the product back to us within 7 calendar days of your call to cancel and the COMPANY will not charge you anything more. What this means is that IF you receive the kit soon enough that you have ANY time left in your 14-day trial, and IF you can through to them to arrange a return and an RMA number, and IF you return the product IN TIME, and YOUR expense (traceable mail means 2-Day Priority, Medium-Sized Box, $11.30), then you just might escape this scam for the low, low price of $17-$18. Minimum. You, our faithful readers already know this stuff. 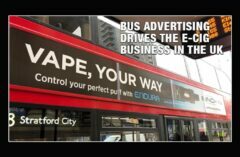 But, smokers who have no yet ventured into the land of electronic cigarettes do not. They have NO IDEA what a pack of prefilled cartomizer “should” cost, nor do they know there is a difference in QUALITY of various eLiquids. Some smokers may even think that buying 15 cartomizers for $39.95 plus shipping, is a pretty good deal, despite being twice as much as the “good stuff”. 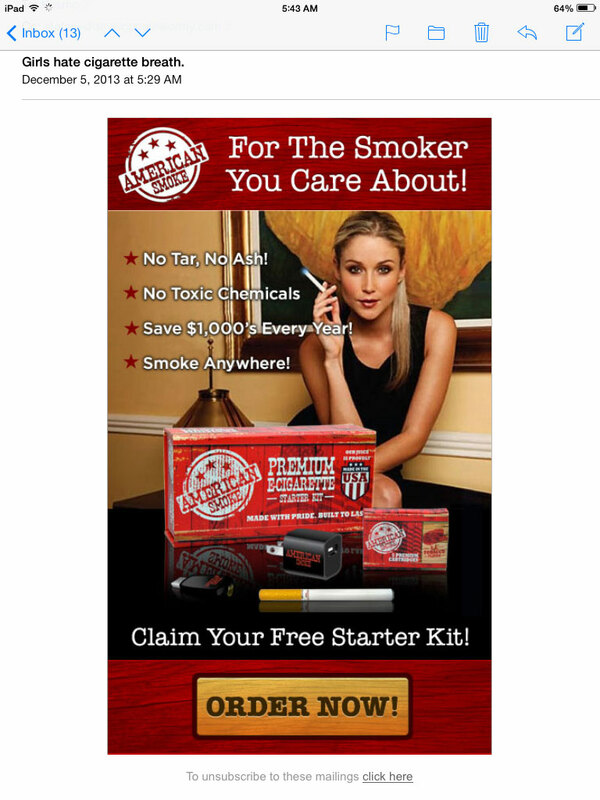 Is American Smoke running a scam? Of course they are, they bring you to their site under the guise of receiving a FREE starter kit and then they have you committing to a purchase of $89.95 and $39.95 a month for cheap products. Now, granted, American Smoke’s scam costs less than the others we’ve written about, so let’s give credit where credit is earned. However, what is stopping these guys from playing in the legitimate sandbox? Two things; greed and ignorance. Greed by these guys that know how ignorant smokers are when they know nothing about electronic cigarettes. “Caveat emptor” you say? Is that really how we want things to be? Look, my problem with these guys, and all the others guys that run these operations out of their homes is that this industry really has an opportunity to save us all from billions and billions of dollars of healthcare costs and tens of thousands of lives and they are jeopardizing it. 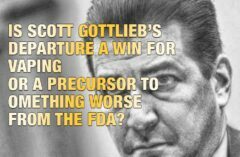 When an unsuspecting smoker desperately wants to get off the fast road to cancer, heart disease, and other illnesses and cannot kick the nicotine addiction, but doesn’t have the wherewithal to investigate the industry, to learn the facts, to compare products, and yes, to actually think there are companies out there willing to send you a starter kit for free, then damnit we need to expose these operators for what they are, greedy people who just don’t care. American Smoke is playing the same game as the others, but they are charging less than the others, but it still doesn’t make it right. It’s legal, but that doesn’t mean its right. We, and that means me, you, and everyone else that does know the industry to some extent, have an obligation to the people who have not yet made the switch to electronic cigarettes to help them avoid these tasteless, cheap products that they will do nothing more than chase them back to cigarettes with a vow never to look at e-cigarettes again, and about $100 lighter in the wallet. We publish these Scam Alerts not to warn you to stay away, you’re already buying your eJuice, cartomizers, batteries, and other vape gear from reliable vendors. We publish these alerts so that once it’s published, once it’s been crawled by Google and Bing, it’s out there, and anyone that types the company’s name into a search engine will see it. Maybe, just maybe, we can get these companies to stop what they’re doing. If not, well, maybe enough people will begin to do a little investigating before they fall for these “free” rip-offs so that its no longer profitable for these companies to operate. And because we know these guys read Spinfuel, I’m going to address them directly. Next : Johnson Creek Valet – First Look!